As the name suggests, this bar plays retro music until the late hours. There is a live band almost everyday (except Thursdays) and DJs that keep playing the hits of 60s to 80s. 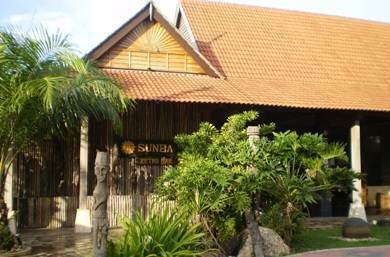 Sunba Retro Bar is located in the Sun Mall Complex of Pantai Tengah, which is managed by the Sun Group. While the complex itself looks like a mini village which setup in a lush greenery, the retro bar inside has mimicked an old traditional village house of Malaysia with all wooden furniture and thus giving a rustic look. Although the village like setting inside is cozy and welcoming, this is an upscale bar and mostly patronized by the locals. You will meet many singles over here. This is one bar in the area which remains open till the wee hours. They have a great selection of cocktails as well as non alcoholic beverages. Drinks are not cheap by any means. A small bottle of beer would cost between RM8 to RM11 plus an additional 10% charge. Some of the great & unique cocktails here are Flaming Lamborghini (the glass in which the cocktail is served comes with blue flames and looks awesome), Milo Ice and the bar special called Sunba Sunba. While they also serve food, it is not required to dine here. So what other options do you have at Sunba other than drinking and listening to live retro music? Actually this is one bar where you can also dance to the live music. You will find that the dance scene here starts picking up after midnight. Alternatively if your hands are not already shaking, you can even play a game of pool here. 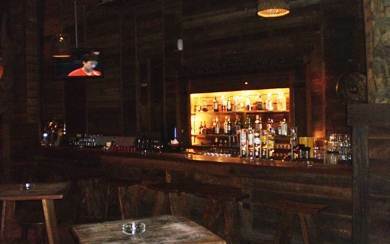 An LCD TV next to bar shows sport channel. Right next to the Sunba Retro Bar is SunKarma chill out lounge. It has a nice outside patio and modern inside seating. This is a nice place to just chill out or have a chat with friends over a drink. This too is upscale and prices are similar. It is open daily till midnight. Before or after having a couple of drinks, if you plan to take a proper dinner, then try out the adjacent SunSutra which is a proper restaurant serving a range of International and Asian dishes. Sunsutra is also open daily until midnight. Opens 7pm - 2am daily. Live band plays from 11pm onwards (off only on Thursdays). You can walk in. No reservation is required. Credit cards accepted.